Facebook’s now has a new strong emphasis on the response time a Page should provide for anyone messaging a Page. (this doesn’t have anything to do with Personal Profiles on Facebook). This week I am conducting a seminar on Blogging – How to do it, When to do it, Why to do it and Where to do it – so I think a fresh blog on a developing story is in order! Of course you know I will include a link to the details of the seminar Here. Apparently, Facebook received many complaints that many Pages didn’t respond to direct messages from fans, potential fans, visitors, whatever. This didn’t sit well with Facebook (my opinion!) and so they have created a whole series of new features that reward and recognize those that response very quickly, and not really penalize but certainly discourage slow message responses. Let me show you with illustrations – these are all screen shots using Windows 10 amazing Snipping Tool. (it was also available in earlier Windows editions). Once you have made your choice about your response time, the Messaging section under Settings disappears. It isn’t evident as yet about how to adjust your response time after your first choice. Best practise for now? Choose the Automatically show your average response time suggested by Facebook. If you don’t see Messaging under your left hand menu under Settings then you haven’t received enough messages to your page for Facebook to advise you of this Feature. An obvious and glaring warning to those who believe response time to messages to your Facebook Page is important…….Please ensure your friends, who may want to contact you quickly, use your personal profile to message you, not your Facebook Page for your business, organization, non-profit, whatever. They may be inadvertently lowering your response rate by messaging the page. Finally, every time I blog about a new – and sometimes hard to find – feature on Facebook, I get great response, thanks, new e-newsletter sign ups, etc. I literally could do this as a steady diet, but I yearn to blog about other social networks from time to time, new philosophies, new developments, etc. What do you really want to hear from me? Hope to see you at my Blogging seminar on Wednesday, September 23rd! Not sure how you do it. Keeping up with ever evolving FB Page rules and regulations could be a full time job in itself. The answer is I don’t do it nearly enough, Shelley. Thanks for your kind comments, but just thoroughly researching for this blog today uncovered three new changes/new features/ on three different social networks. Even the amazing Mari Smith, with quite a team of helpers, can’t keep up with every change/addition/deletion/and philosophy change in social media. I try to stick to those changes that have relevance for my targetted client base. the thing i really dislike about this feature is that i have followers from different countries, so i may get a message at 3a and not see it for several hours, which lowers my response time. i think that’s unfair and should somehow be accounted for. Our pages response time was correct (responds to 100% of messages in less than an hour), but then suddenly went to 66% response with a time of 2 days. We hadn’t had any new messages in well over a week. It just suddenly switch. Any idea why this would happen, and more importantly how to fix it? That’s unusual, Sam. If you happen to miss a message, it certainly affects the % of message responses, and depending on how long until you respond, obviously the time it takes to respond is affected. But, if you have had no messages, I don’t know why this would happen. I would say trying to fix it would be too time consuming to be worth it. 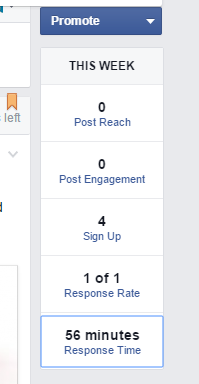 Why not get a few people to send a message to your Page from their personal FB profile, and respond immediately? This will probably set things right. More than one way to skin a Facebook cat. Thanks for your question. What actual responses are taken into account? I ask because if one receives a question or comment relating to your page, it is normal that you would reply. But what about a user post such as “Great Job” or “Love your page!”, where a full response is usually not necessary. Are you required to respond to this, or does a ‘Like’ on their comment tally as a response? I am VERY sorry to take so long to reply, Relja! When you get a compliment or testimonial or whatever through the messaging system, simply respond with a thumbs up. It acknowledges that you received the message and also says to the person doing the messaging that you appreciate their comment. Hi, get frustrated with this feature because when I am very fast at responding typically within minutes but if the customer leaves the last response and you feel like it would be annoying to keep responding back it counts it as you not responding and it lowers you time. A typical conversation would be like this: customer: do you have this in black? Me: yes we do would you like to order one? Customer: yes. Me: great I will get that sent to you today! Customer: Thank you Me: no problem (at this point I am only responding to get a response time but then…) Customer: Thanks or thumbs up. Now how do I respond to this??? I think it would be silly or annoying to the customer to respond with another thumbs up but if I don’t the response time get significantly affected. I can go from a response time of minutes to a response time of days. I’ve tried checking that I have read the comment but it doesn’t seem to help. Jennifer, I really apologize for this late response. You took some time to carefully outline your situation and I read it through equally carefully. I needed to get some solid answers for you and it took a little time. The easy answer is thumbs up. Or, a pleasure to do business with you. Customers are Facebook users too and it has become very mainstream to see two thumbs up at the end of any messaging within Facebook. I agree, very silly that Facebook requires this to ‘close out’ a conversation, but it’s just one click and you are good to go. Incidentally, the latest from social media experts like Mari Smith, Jay Bauer or Mike Stetlzer says ‘don’t drive yourself crazy with this messaging deadline stuff. We all want to get back to customers or anyone interested in our Page, we can only get back as quickly as possible and not more and not less. There are way more efficient ways to increase reach than worrying about getting back to every message to your Page within minutes. Thanks so much for your question and again, my apologies for this very late response.